Today, Baby Hazel is celebrating Christmas along with her friends, Bella & Liam, along with Honey Bonny and Katy, the cute little cat. She is eagerly waiting for Santa and very excited about what she is going to receive in presents. So she wants to complete all Christmas preparations as soon as possible. She has to pack gifts, make snowman and ride on snowboard, play snow fight and many more. This is good opportunity to celebrate Christmas with Baby Hazel and her friends too. Play this game and help her in completing all activities before Santa arrives. See what Santa gifts Baby Hazel. So, what are you waiting for? 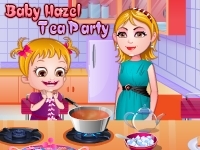 Enjoy Christmas night along with Baby Hazel & her friends.